I’m pretty sure everyone loves a good recipe that incorporates bacon, I know I do! 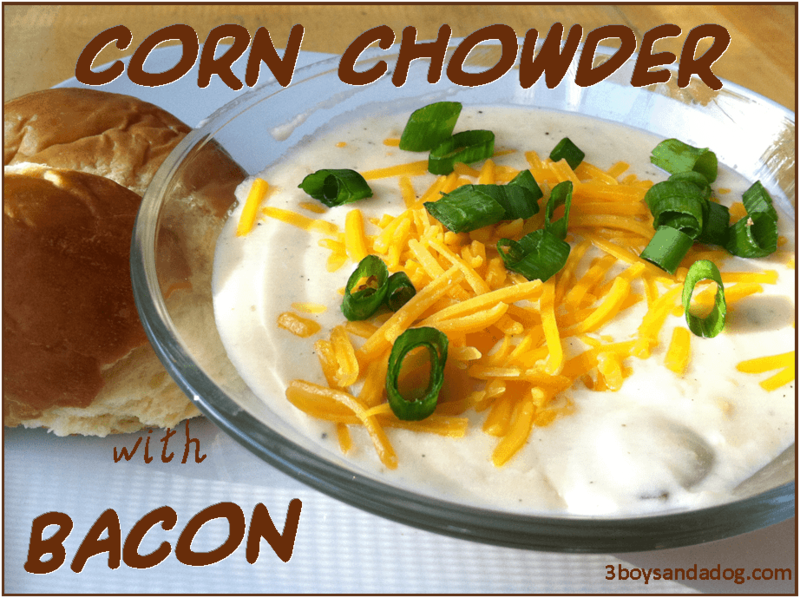 Corn Chowder with Bacon and Potatoes is one of my favorite quick and easy recipes. You simply put all the ingredients together and before you know it dinner is ready! This dish takes almost no time at all to cook and requires ingredients you probably already have in your kitchen. If you are trying to lower your family’s monthly grocery budget, this dish needs to be on your list! I like to serve the Corn Chowder with Bacon & Potatoes with fresh warm bread. My favorite bread to serve with this dish is my Irish Soda Bread Recipe. This bread is easy to make and it doesn’t require any yeast! This dish takes almost no time at all to cook and requires ingredients you probably already have in your kitchen. In a large saucepan, bring broth and evaporated milk to a boil. Reduce heat to low. Add the remaining ingredients and stir to blend. Cook until desired consistency is reached, about 10 minutes. Garnish with shredded cheddar cheese, sliced green onions and bacon bits if desired. Add hot bread and a dessert to put a smile on everyone's face! Oh wow, this sounds super yummy! 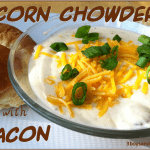 We just love Corn Chowder, this looks awesome! Thank you so much for sharing with Full Plate Thursday and have a great weekend! Oh yum, this sounds like a soup you just couldn’t go wrong with, especially on a day like today where I need something to warm me. Looks yummy, Kelli! Love that it has bacon!